From today's perspective, it seems amazing to think that Macedonia was actually one of the frontrunners on the road to European integration in the Balkans, even before the most recent member of the EU club, Croatia. Macedonians celebrate independence day in Skopje. Demotix/Marjan Janevski. All rights reserved.On 4 March 2015, the High Representative/Vice President of the European Commission Federica Mogherini and European Neighborhood Commissioner Johannes Hahn expressed readiness to (once again) help Macedonia in managing an ongoing political crisis between the opposition and the government. This latest EU offer comes after the Prime Minister pressed charges against the leader of the opposition for espionage and violent overthrow. At the same time, a major wiretapping scandal was made public by the biggest opposition party, Social Democratic Union of Macedonia (SDSM). Since early February, the SDSM leadership has been gradually broadcasting wiretapped recordings between the government ministers containing elements of abuse of official power, use of state resources for party purposes, pressure on the judiciary and media, to name just a few. According to them more than 20,000 people, including current and former ministers, opposition leaders and journalists were subject to surveillance for the last four years. This scandal comes after a 9 year inter-ethnic coalition government headed by the Internal Democratic Revolutionary Organisation – Democratic Party for Macedonian National Unity (VMRO-DPMNE), a party that came to power in 2006 when Macedonia had just become a candidate for EU membership. In a short lived coalition with the Democratic Party of Albanians (DPA) until 2008, and with the Democratic Union for Integration (DUI) since, VMRO-DPMNE came to power promising economic revival with technocratic leadership. Although this might have been the objective in the first half of their rule, the last five years have take a quite different turn with backsliding on various fronts, especially political rights, such as freedom of expression. For example, since 2008 the key government undertaking has been a lavish architectural project in Skopje, involving the construction of numerous buildings and monuments raising many eyebrows in the relatively poor post-Yugoslav state. This project has materialised hand in hand with the use of nationalistic discourses and increasing stronghold of the parties in power over the state administration, imprisonment of journalists, failure to sanction or process duly cases related to corruption, to name just a few. This state capture has been further made possible by the continuous lack of a functioning opposition in the national institutions, including the Parliament. In fact, Macedonia has been in a perpetual political crisis since the end of 2012 when the opposition was forcefully removed from the parliamentary hall during the discussions for the annual budget. Although the major opposition party SDSM participated in the local elections of 2013 and the general elections of 2014, they have been operating outside of the institutions for the last two years. In parallel, the media landscape has been violated by transferring government funds to outlets supportive of the ruling political parties. In these circumstances, crucial legislation and policies have been passed without meaningful public or institutional consultation. In practice, the parties in power have attempted to create a public environment in which they can operate with very little criticism or dissent. These events have largely coincided with the blockade of Macedonia’s further EU integration prompted by the dispute with Greece over the country’s constitutional name. As a result of this dispute, Macedonia has had six (futile) consecutive recommendations for starting the accession negotiations with the EU. In fact, the small country of two million which was praised in the early 1990s as the peaceful reformer in the Balkans has become the longest standing candidate for EU membership without negotiations after Turkey. From today's perspective, it seems amazing to think that Macedonia was actually one of the frontrunners on the road to European integration in the Balkans, even before the most recent member of the EU club, Croatia. In fact, the last meaningful internal reforms in the context of EU probably took place in 2009 when the EU decided to offer Macedonia and its regional neighbours the possibility to travel without visas. Since then, the Europeanisation of Macedonia has been one failed initiative after another, although this process was praised for its transformative power in Eastern Europe in the late 1990s and early 2000s. The European Commission has attempted various forms of engagements with Macedonia on the margins of what would be normal modes of communication with an acceding country, as the latter are procedurally impossible. These have included both technical contacts between the civil servants as well as high level discussions between the Prime Minister and the Enlargement Commissioner. None of them have in fact worked as they are quite contrary to the logic of the accession process as such which offers the prospect of membership in exchange for pursuing often difficult reforms. With the name issue in the way of the regular accession conditionality, the EU has in fact compromised its potential for bringing transformative change in Macedonia. In addition, although in the early years of this difficult relationship the Commission was reluctant to provide outright criticisms, the latest 2014 progress report on the country was an exception to the rule. In it, the European Commission has recognised backsliding and conditioned the maintaining of the recommendations for launching accession negotiations upon progress in the reforms. The deadlock on the EU integration front has had an internal price as well, since the trust in the EU has been constantly declining among the public that is still nevertheless supportive of EU membership. Symbolically, the EU still carries weight in Macedonia because EU integration has been a shared goal and a binding tissue of the two otherwise largely divided communities in the country, i.e. the ethnic Macedonian and Albanian. For Macedonia, whuch underwent an internal inter-ethnic conflict in 2001, the EU accession prospects were the common objective for all communities living in the country. 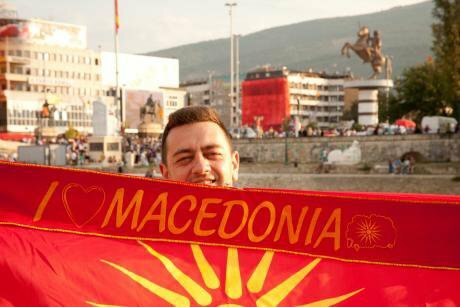 Further delays in the country’s path towards the Union are likely to widen the already visible gap between the ethnic Macedonian and Albanian citizens in the country, fuelling nationalistic tactics and a sense of transformation fatigue. A major alternative promoted by the government have been the so called free economic zones where foreign companies are provided with financial incentives for transferring their largely low skilled production outlets to the country. While these companies have provided much needed employment, the country still remains at the bottom in Europe with unemployment of around 30%. Officially, attempts were also made also to reach out to or engage with non-EU countries, such as Russia and India, though these have also been unsuccessful. Even with major government efforts at attracting investments etc, the political instability and stagnation on the EU road have taken their toll. Hence, the country still receives modest per-capita investment amounts and the economy is in a difficult state in parallel with its troubling EU integration. Not surprising, in such circumstances, the state administration has remained the primary employment channel and has been extensively used by the parties in power as a mean of ensuring survival. In light of the circumstances, this last wiretapping scandal, for many, signals the existence of authoritarian and likely illegal practices in the country. Still, given the major accusations of the opposition, the institutional responses have been feeble. At the same time, some of the arguments used in the public debate condone such practices, indicating a worrying trend of acceptance and normalization of authoritarianism. Signs of emerging dissent with the overall mode of governing were recent waves of protests of students, teachers, journalists and contracted workers at the end of 2014 and early 2015, which were important primarily as an example that there the party control over every aspect of public life can be cracked. Due to the pressure of these groups and the burden of the tapping scandal hanging over his head, the Prime Minister has succumbed partly to pressures leading to concessions on numerous policies, which was unimaginable just a few months ago. In this context, it is likely that the help of Mogherini and Hahn is not optional, but a necessity due to the multitude of internal challenges the country is facing. On the bright side, the EU does hold a track record of crisis solving in the Balkans. In addition, a serious effort in Macedonia will also enable the Union to regain trust among the population and reclaim its position as a democratizing agent. Yet, given that the Greek veto has compromised EU conditionality in Macedonia it is difficult to see whether and how the EU can engage meaningfully the local political actors. One can only hope that the EU officials will have a major ace up their sleeve on their next trip to Skopje.